Духовые инструменты. История исполнительского искусства. Учебное пособие. 1-е изд. Автор: Толмачев Ю.А., Дубок В. Ю. 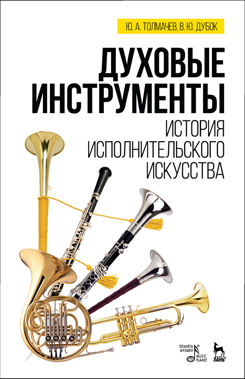 The book provides the integrated data on the theory and history of pops orchestra instruments performance. One part is dedicated to jazz performance. The development and formation of method to teach how to play pops orchestra instruments in Russia and abroad are examined. The main technological approaches and methods of teaching are also summarized. The textbook is intended for university and college students, studying pops orchestra instruments and musical variety art.